This research project started in May 2013 and was based in the Dubai Desert Conservation Reserve situated 60 km South East of Dubai. Upon noticing a decline in the body condition in the Arabian Oryx population of the Dubai Desert Conservation Reserve (D.D.C.R), it was decided to increase both the number of feeding stations and the amount of feed in an attempt to increase the Body Condition Score (BCS). 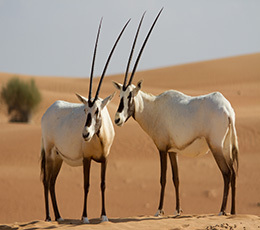 The different Oryx herds were evaluating over a 3 month period, utilising the body condition scoring method to provide a measurable indicator of the fitness of the Arabian Oryx. The initial month of the survey resulted in a BCS = 1.1 which indicated a thin population. By the end of the survey the BCS = 2.2 which indicated an improvement to a level of malnutrition. The past 3 months has shown a steady increase in BCS. Continuing this feeding programme will ensure the continuous improvement of BCS to the predetermined goal of a 3 indicating a fit and healthy population.